This information has been compiled from a multitude of sources by Margaret Peacocke, a great-great- grand-daughter of Edward & Annie Paddison. COPYRIGHT 2007 in its entirety. Once the Treaty of Waitangi was signed in 1840, New Zealand began its quest for immigrants to build ‘a new country’. Many who became New Zealand’s early pioneers, like Edward Paddison were not the eldest son and heir and had no chance of owning land in England. New Zealand offered them the dream of being able, through hard work, to have opportunities that were out-of-reach to them in the country of their birth. It is believed that Edward and the others – George Stark, Alfred and William Edlington - who sailed on the ‘Mataoka’ and made their way to Great Barrier Island with him, had pre-arranged jobs at the copper mine. Once the mine closed in 1867, they became landowners with George Stark and the Edlingtons choosing land on the eastern side of the island. The only other families in the FitzRoy area at that time were the Moors and the Flinns. 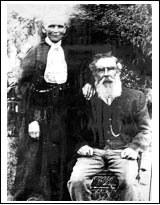 The story has been passed down through the family that “when Edward Paddison took up his completely virgin property at Karaka Bay, he arrived with only a few clothes, a rifle and ammunition, a kit of tools, a camp oven and a sack each of flour and sugar. He slept the first night under the karaka tree, probably the tree after which he named the bay, a few yards from the beach.” Presumably he spent the next day making some sort of shelter. By the time of his marriage in December 1867, he had built a house and cleared some of the land. The original house was quite large for those times. It had a kitchen, dining room, sitting room, three bedrooms and an outhouse. It was built from pit-sawn timber with wooden spouting and a roof of split kauri shingles. Following the closure of the mine, life on the Barrier was very difficult. Boats had no reason to visit the island, so its inhabitants were very isolated. The land had to be cleared before it could be farmed. It was a struggle to survive with neither equipment nor capital. To survive, people needed alternative ways of earning an income - gum digging, kauri logging, cutting of manuka & kanuka for firewood. Selling firewood was a lifesaver for the Paddisons. By the 1880s things were slowly becoming a little easier for Barrier settlers. Scows plied fairly regularly between the Barrier and Auckland so the locals could ‘export’ crayfish, puriri fence posts and ti tree firewood to the city for cash. Because there were no roads, the firewood was taken to the beach where it was loaded on to the flat- bottomed scows that were designed to run up onto the beaches where they were loaded at low tide and floated off at high tide. It also meant that goods that were not available on the island could be sent from Auckland. 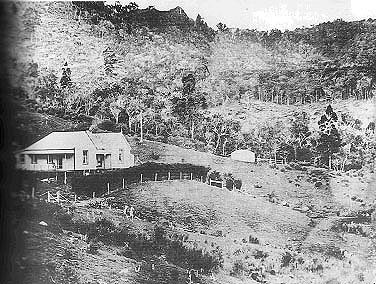 Removing the trees helped with the process of breaking in the land for farming, but once the bush on the hills behind the Paddison’s house had been cut, the topsoil would wash away during heavy rain. that grew beside the cow shed was so prolific that it provided enough fruit for the neighbours as well. Lemons and ‘poorman’s orange’ trees grew on the flatter slope up towards the creek at the back of the house. Kumaras grew particularly well in front of the house. In the early days, the piece of land by the graveyard was called Peach Garden because when Edward Paddison settled at Karaka Bay there were old peach trees growing there. Apparently, the Maoris planted them from peach stones, which some suggest were carried to New Zealand by Captain Cook. There were also three very large fig trees by the stream near the graves that were thought to have been there since Cook’s visit. However, it is uncertain whether Captain Cook actually landed on “Big Barrier” as he named it. So these seeds may have come from the first ‘recorded’ vessel to land. It was a whaler, the Mermaid and it spent three months anchored in Port FitzRoy arriving in November 1796. (In Port FitzRoy, on the boundary of the Le Roy land at Rarohara Bay, there is a creek that was called Peach Tree Creek and had peach trees too old to have been planted by the early settlers. Maybe these were planted by the Maori living there at the time or by the whalers on the Mermaid who were anchored close by). “In Karaka Bay, Mr E Paddison has a nice place with a good garden and some fine growing land. A good deal of firewood sent away from here is of the best quality. Mr Paddison is a thoroughly cheerful, contented settler; just the sort of man for a new country.” (Taken from Rev Hazelden’s report published in the Auckland Weekly News (about 1883). In 1877, a law was passed making primary education in New Zealand “free, secular and compulsory”. It took some time for application of this change to reach Great Barrier Island as it was not until 1879 that the settlers of Port FitzRoy formed a school committee with the Paddisons’ neighbour, John Moor as the manager. In September 1879, the first teacher was appointed to the island - Mr R Kinross. When he arrived, there was no school or school house, so he spent a week at a time living with each of the three families in the area – Moors, Paddisons and Flinns - and teaching the children of the household while he was there. It must have been quite a burden on these families, especially the Moors and Flinns who had a number of children each, to find a space for the teacher to sleep and an area that could be used for school lessons. FitzRoy has no schoolhouse but a capital master who travels from house to house in his little punt staying a week with one family then moving on to the next.” Quote from Rev J Hazelden in the Auckland Weekly News (about 1883). We know that he spent the first week with the Moors because their children were ‘admitted’ on the Great Barrier School Register on 1 September 1879. The Paddison’s hosted the teacher the next week. At this time, the Paddisons had five children and Annie was pregnant with Edith (born January 1880). Ralph was born 18 months later. It must have been a busy household, especially for the one week in three when the family hosted the teacher. The Paddisons’ lessons were probably initially held in the woolshed at Karaka Bay. By 1894 (15 years later) a room had been built at the end of the woolshed/cowshed for this purpose. Church services and celebrations were also held in the woolshed with neighbours coming by rowboat or by hiking over rough tracks. A dairy and bathroom/laundry were built in about 1900 with wooden tubs, a wooden bath and a copper for boiling the clothes. There was also a room in the same building to store grain used by the family and to feed to the chooks. The house, at this time, was lit by kerosene lamps – one in each of the main rooms - and candles elsewhere. (Great Barrier is still not connected to the national electricity grid. Locals use generators or solar power). Nearly all the furniture was hand-made from rough-cut timber grown on the property and shaped by adze. Kerosene was purchased in 4-gallon tins which were packed in pairs in wooden boxes. When three or four of these boxes were stacked on their sides, they made useful shelves when there were no sets of drawers. For many years, there were no water tanks, so all the water had to be carried in buckets from the stream up the steep path to the house. This changed in 1905 when water was piped from further up the hill and gravity-fed to the house. Even with ten children, (Another baby, George, born in 1875, had only survived for 13 days. His younger brother, Samuel George, born in 1876, was known as George as a child, possibly to avoid confusion with cousin Samuel Cooper who possibly lived with them and was three years older), all the cooking was done on an open fire. The fireplace was at least seven feet (2.13 metres) wide, three feet deep and about 6 feet high. Set into the sides was an iron bar from which hung a number of heavy hooks of varied length. On these, kettles and pots were hung and moved either over or away from the heat of the fire. There were several black iron kettles of varying sizes from small to a large one holding four gallons of water. Water heated in these over the fire was the only source of hot water. The fire seldom went out summer or winter. When cooking, smaller logs were put on the fire to get it burning hot, but overnight, large logs were used just to keep it smouldering and the water in the kettles hot for the morning. Only hard wood was used on the fire as it did not spark – sparks were feared because of the risk of fire. Puriri did not need to be dried. It would burn very hot for hours. Ti tree had to be dry or else it would smoke, so it was used wet when smoking pig’s legs to make ham. Porridge was cooked overnight on the smouldering fire. It was made from home-grown oats and hung over the fire last thing at night ready to be eaten for breakfast in the morning. The bricks for the enormous fire places and chimneys were made locally (although not at Karaka Bay). The settlers also built the fireplaces themselves working together sharing their skills. The large outside oven was built early in the twentieth century – ‘the bake house’. It too was enormous and built of bricks – some 5 feet deep, 15-18 inches high and wide with a heavy iron door and chimney at one end. Bread was baked in it twice a week. A very hot fire was built inside it and left for several hours before being raked out, the chimney closed and the loaves put in. When the bread was cooked, there was still enough heat in the bricks to cook buns, pies or other baking. Edward and Annie’s sons enjoyed hunting, shooting and fishing, so they were able to provide meat and fish for the table. Hanging by the back door was a large bull’s horn. When it was nearly meal time, Edward would blow several loud blasts on the horn and the children, even as adults, would come home from wherever they were. They didn’t have watches to tell them the time. It is said that the bellow of the horn could be heard for miles and that Edward was the only person who could make such a blast. Sometime around the late 1890s, William Edlington, (He had emigrated with Edward Paddison on the ‘Mataoka’. Assuming that he was a similar age to Edward Paddison, he would have been in his 60s at this time. He is buried at Karaka Bay). who had never married, came to Karaka Bay, living with the Paddisons until his death. He looked after the gardens, seemingly always able to produce an abundance of vegetables. When Edward and ‘Weelie’ got past doing the garden, Frank and Roy took over as they continued to live at Karaka Bay. Frank did not marry until after both his parents had died. He married Mrs Mason who already had a family. Together they had two more children, Bert (Herbert) and Guelda. Roy never married. In 1897, a group of visitors went to the Barrier for a holiday travelling on the Northern Steamship Company boat “Iona”. The following is part of their report. By 1912, with their children now grown up and all the girls married and living elsewhere, the Paddisons opened their home up as a Guest House. Many young people holidayed there. This is where Bert Le Roy met two of the Thorpe girls which lead to his meeting and later marrying their sister, Estelle. Farming around Port FitzRoy in particular did not make a good living and this summer business helped the family finances. When Edward and Annie’s eldest son, Joseph (Joe) married Alice Paultridge in 1900, the parents gave the newly-weds a piece of their land facing Port FitzRoy. By 1901, they had built ‘Glenfern’. This too was used for paying guests over the summer. Joe was employed in the early 1900s to work on the erection of the timber dams that were used to flush the kauri logs down the streams to the coast where they could be roped together and towed to Auckland. In addition, Alice was appointed teacher at Okiwi School in May 1912. Each day she took her three school-age children (aged 9, 8, and 7) over the hill to school. The school was closed at the end of the year, possibly because the four-mile trek was too much for them all in the winter. Her children then returned to Great Barrier School, as did Roland Sanderson (Roland Sanderson (Roly) was the son of William and Amy (nee Paddison), who had also been attending Okiwi School. Annie Cooper (Annie was the daughter of Samuel Cooper who was the son of Elizabeth (nee Cooper) and brother of Annie Paddison), was enrolled later in 1913. The three Paddison children, Roly Sanderson & Annie Cooper all went by row boat from the Paddisons to the school, which for many years was held at Le Roys at Rarohara Bay in Port FitzRoy. It seems likely that these young relatives stayed (at least during the week) with their Paddison cousins. Alice Paddison taught at this school one week in every two, teaching the Maori children at Katherine Bay on alternate weeks. Enrolments at FitzRoy School in 1929 indicate that Mrs JE Paddison was Guardian for three other children attending the school – Harold Moyle and Christopher & Vincent Paultridge (as Paultridge was Alice Paddison’s maiden name, we can assume that at least two of these children were relatives), so presumably, they lived with the Paddisons. In the 1920s two pelton wheels were brought to the island from the Thames goldfields by one of the locals to provide electricity – a first for the island. One of the wheels required more water than Jonathan Blackwell had available, so he sold it to Joseph Paddison. Joe built a hydro pelton wheel electrical system that was used from 1929 until after WW2 when the Coopers switched to a diesel generator. The creek behind the house was dammed and a four inch pipe ran down to the beach – giving 100ft of head pressure. During the summer, the tap was opened for five or six hours per day: the pelton wheel spun and the flat pulley belt turned a 32 volt generator, which pumped out 15 to 20 amps. Batteries were thus charged and wires ran back to the guest house 150 metres away. The system enabled the lights and a refrigerator (ice-cream for guests) to be operated. (From “Ye Olde Barrier Scrapbook” – Dave Watson. The old Paddison wheel is displayed in the GBI Milk, Honey & Grain Museum at Claris). Following Joe’s death in 1933, and the marriage of his eldest daughter, Edna to Reginald Cooper (Reg Cooper was a grandson of Elizabeth Cooper. Elizabeth had three children. The second, Samuel was Reg’s father and Edna’s grandparents were Edward and Annie Paddison. So Reg Cooper was Edna’s father’s cousin), in the following year, the newly weds moved into the guest house with Alice (Alice died in 1947) and managed it. The owners were adamant that they didn’t want ‘riff raff’ arriving there, so there was no road access, and guests were taken from Port FitzRoy Wharf across the harbour in the guesthouse launch. About 30 people stayed at Glenfern coming and going over the holiday period. It had a big dining room – sitting room with a piano, and usually someone played the piano and there was a sing-song each evening. After breakfast nearly everyone went out on the guesthouse launch for fishing, especially when there were two launches and plenty of space. There was no problem catching fish. After fishing in the morning, they would go ashore and boil up a four-gallon kerosene tin of salt water, and cook fish and potatoes in it, which they would eat with bread and butter on the beach. Then they would have an hour or so of more fishing before heading back on their slow boat. Then right up in the harbour they would lift the set crayfish pots, and re-bait them. There was fresh crayfish every day and for lunch too if that’s what people wanted. A great sight was the dolphins playing in the bay and draping themselves in seaweed. There were also lots of large whales. There were also sharks & many sea birds. One day was set aside for climbing Mt Hobson and another for visiting the gannets on Gannet Island. (Tales from Great Barrier Island” – Helen Jordan Luff). The Coopers and their boarding house ‘Glenfern’ had a loyal clientele for so long that some of their guests who started coming here as children came back with children of their own. The FitzRoy Post Office and the manual telephone exchange were set up in a lean-to addition to the house. When Mrs Cooper relinquished her keys to the Post Office and manual telephone exchange she had operated for forty years, the Department made the rare gesture of a retiring gift and a citation commemorating her devoted service. Following the death of Roy Paddison in 1957, the family farm was sold to Mr Hyde. The 800-acres were subsequently purchased from him by Neville and Dorothy Winger in 1963 to set up the Orama Christian Community. At that time, the homestead was in a bad state of repair and has subsequently been demolished. (The Paddisons subdivided the original 1,000 acres in about 1900 to give son, Joseph (Joe) a block of land). n 2006, some of the land and facilities were leased from the Community to be used as the Great Barrier Outdoor Marine Centre, a division of the Sir Edmund Hillary Outdoor Pursuits Centre of NZ. Other relatives – William Cooper (jnr) [cousin of Annie Paddison] and Gladys Priest [Edward and Annie's grand-daughter]. Joseph Edward Paddison, Born: 1871, Married 1900, Died: 1933, Buried: Karaka Bay. Herbert's children; Gayleen, Raymond, Lorraine, Les, Stephen. This is the only family descending from Edward through which the Paddison name continues. Died: 1931 or 1936. Child: A daughter who was killed in a horse riding accident. Herbert Allison Paddison, Born 1886, Died: 1917 during WW1 at Passchendale of war wounds. Lived his whole life at Great Barrier. Please make contact if you have information to add or comments to make.